Description: The book's 42 chapters, 450 pages, and 310 illustrations bulge with everything players, coaches, stringers, retailers, and teaching pros ever wanted to know about tennis equipment and how it affects performance. Best of all, it answers the questions you didn't even know needed asking!. Description: What is the single most important variable in racquet performance? What kind of racquet, strings, and swing produce the most power? How do you create maximum spin? Where on your racquet should you hit the ball? What racquet and string features combine for the most control, comfort, and feel? How do you affect the bounce, speed, spin, and trajectory of the ball to your advantage? This book answers these and other elusive equipment and performance-related questions that have perennially plagued hackers and experts alike. TWU is developed by Crawford Lindsey, coauthor of: The Physics and Technology of Tennis (with Howard Brody, University of Pennsylvania, and Rod Cross, University of Sydney, Australia) and Technical Tennis: Racquets, Strings, Ball, Courts, Spin and Bounce (with Rod Cross). What Is Tennis Warehouse University? Tennis Warehouse University (TWU) is dedicated to helping tennis players scientifically compare and choose racquets and strings as well as to increasing tennis science education. 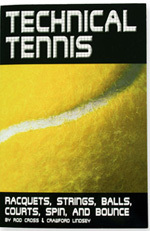 At TWU we test all racquets and strings with specifically designed equipment in our lab. We measure actual performance — not just static propeties such as weight and balance (though we do that too). We integrate these measurements with research compiled by leading experimental physicists and engineers, as well as with the laws of physics. We conduct many experiments at TWU. Our goal is to determine the factors that affect performance. We isolate all variables, measure them, and analyze how changing them affects performance. Then we build equipment to measure these properties in all strings and racquets and we create tools so you can compare them and arrive at intelligent equipment choices. The result is a wealth of comparative and analytical online tools, information, and data that are not available anywhere else. A Racquet Customization Center provides the tools and know-how to help players customize racquets to achieve greater power, stability, and comfort. Both automatic and manual (for fine tuning) tools tell you where to place lead tape to optimize your racquet. Stroke, and shot analysis tools show players how their shots are affected by such things as inbound ball speed and spin, racquet speed, racquet tilt, swing angle, and impact location. 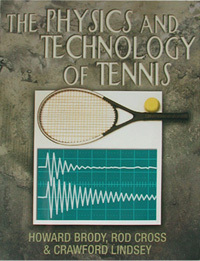 An Article Library explains the hows and whys of tennis racquet science.